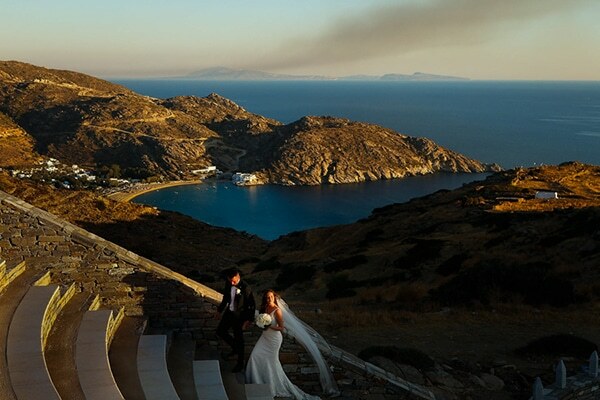 We are sharing today a lovely destination wedding at the beautiful island of Ios captured beautifully by Kapetanakis Studios! 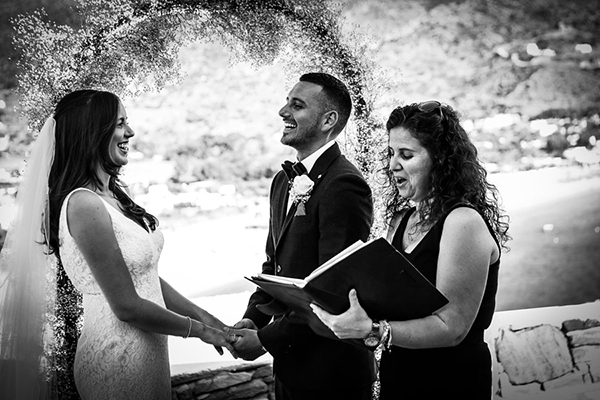 The sweet couple exchanged their vows in a beautiful ceremony overlooking the sea with simple and elegant decoration in white! 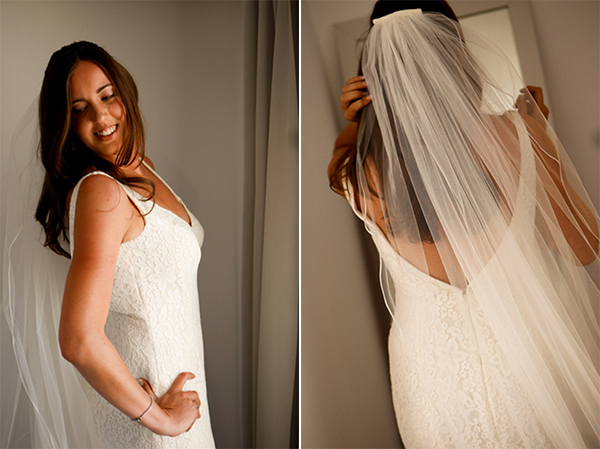 The bride wore a chic Pronovias wedding dress which was perfect for her elegant wedding! “From growing up in the same area together, we had many mutual friends. I always thought Antony was way out of my league and then one night we bumped into each other whilst we were out in Manchester and spent the whole night chatting… 10 years later, here we are. 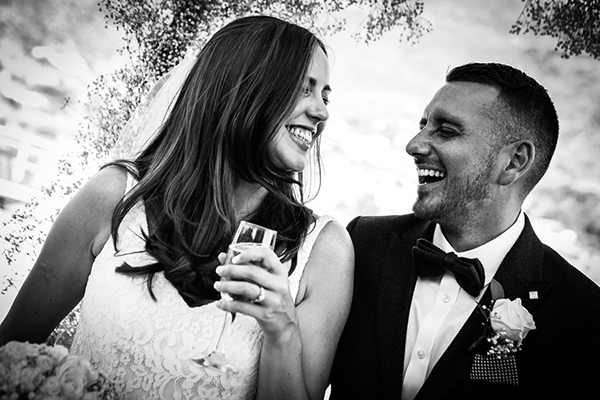 Only took him 8 years, but he whisked me off to Paris, we sat in a private little courtyard just the two of us and after a lot of wine, he got down on one knee in the pouring rain”, the bride shared with us. “We wanted to keep the wedding simple and elegant so didn’t particularly go for a colour theme as I don’t like anything too matchy matchy. I wanted the style to be sophisticated and classy which is why I kept the colour theme white, with ribbon and gypsophila to keep the look modern. To keep in with my modern and sophisticated feel, I went for white rose and hydrangeas with some added gypsophila. 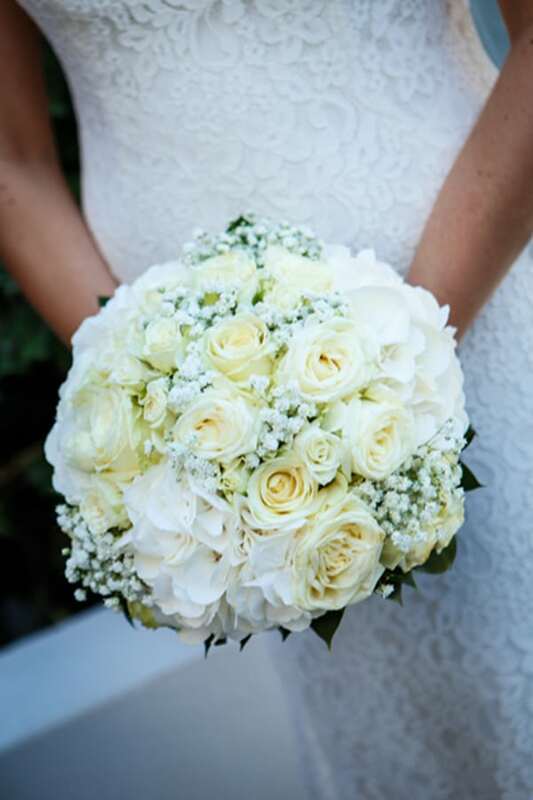 I loved my bouquet as it was all the flowers I love complimented together perfectly”. 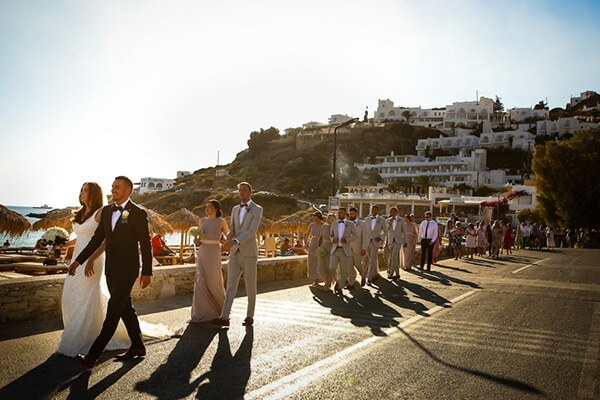 “The best moment of your wedding was walking through the village to the beach accompanied by two traditional Greek musicians, everyone around was clapping and even Barney the dog from the hotel joined us on the beach for some photos. 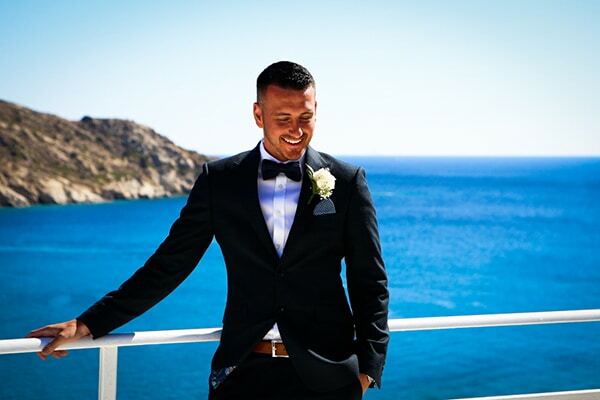 It goes without saying Antony ended up in the pool in his suit after many glasses of champagne along with some of the groomsmen”. 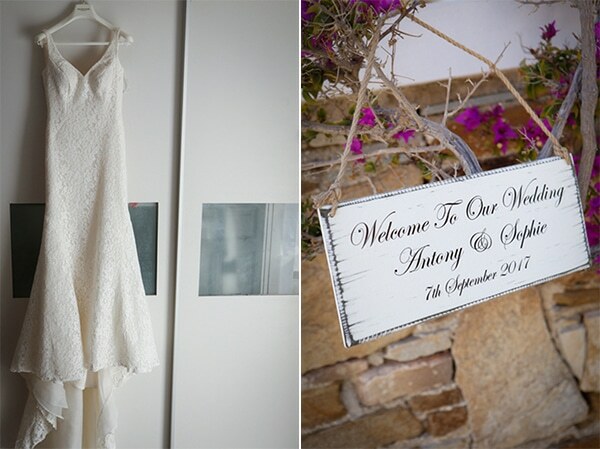 “As the island, views and hotel were all beautiful within themselves, I felt I didn’t want to distract from that too much, so I went for warm white fairy lights, white ribbon on the olive trees, white linen on the tables with tall cylinder vases full of gypsophila and for name places I hand painted pebbles for that personalised touch. 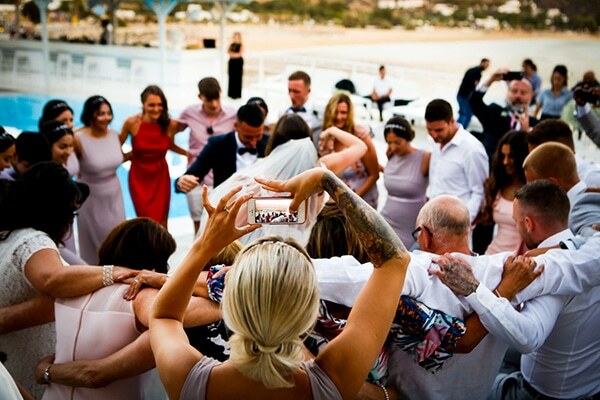 Our favors were mini bottles of ouzo with personalised acrylic hearts with ‘Mr & Mrs Waring – 07.09’ for our guests to have as a keepsake. We were married under a beautiful arch filled with gypsophila”. 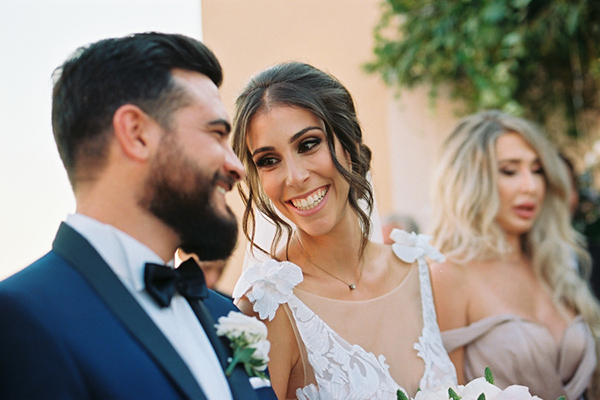 “Ever since I was a little girl I have always known that I wanted to get married abroad as did Antony and we knew exactly the look we wanted, however our wedding planner Eleni from Aegean Dream Weddings helped all our ideas come to life”. 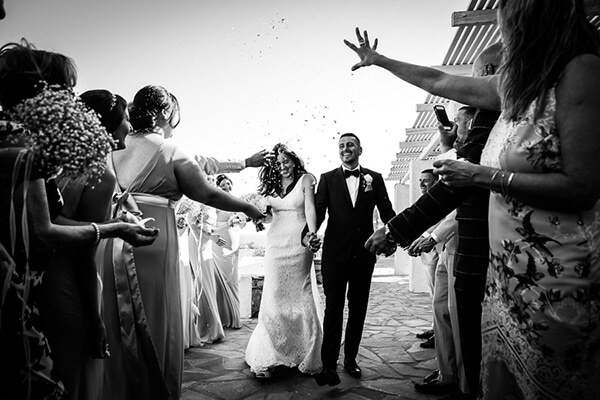 “My dress was by Pronovias and was the Maricel, it was a mermaid dress in all over delicate lace with a V-neck bodice at the front and plunging back. 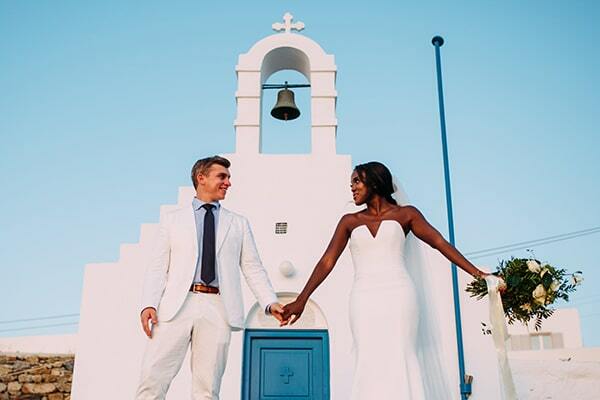 As soon as I tried it on, I knew it was the one, it felt perfect and I really liked that the material was lightweight, perfect for a destination wedding”.